Robert Pinsky is that rare poet who has become a household name. 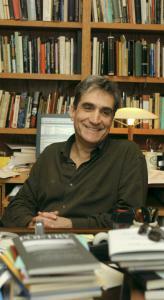 With myriad books to his name, including a best-selling translation of Dante’s “Inferno,’’ Pinsky is a former US poet laureate, founder of the popular Favorite Poem Project, and the poetry editor of Slate.com. He teaches in Boston University’s graduate writing program and lives in Cambridge. What books have stuck with you recently? Two books of stories: Ha Jin’s “A Good Fall’’ and Maile Meloy’s “Both Ways Is the Only Way I Want It.’’ The short story is such a difficult form: the great ones are great, from Chekhov to Grace Paley, but the merely pretty good ones are quite forgettable. Are you doing any reading for current writing projects? I’m putting together a new “Selected Poems,’’ and that has entailed reading “Selecteds’’ by many other poets. I’ve also done a first version of a peculiar project: a play that squeezes Friedrich Schiller’s Wallenstein trilogy into one play. What do you look for in poems? Poetry for me is essentially a vocal form — though not necessarily performative. When I read poems, I try them out with my inner or literal voice: I try to discover if the poet has done something interesting with the sentence-sounds, the cadences, the vowels and consonants. Which poets do you reread most often? Limiting it to English and classical languages, a random sampling might include Elizabeth Bishop, Emily Dickinson, Alan Dugan, Robert Frost, Allen Ginsberg, George Gascoigne, Thomas Hardy, Robert Herrick, Homer, Gerard Manley Hopkins, Horace (David Ferry’s translation), Ben Jonson, John Keats, Fulke Greville, Marianne Moore, Sylvia Plath, Walter Raleigh, Edwin Arlington Robinson, Sappho, Stevie Smith, May Swenson, Wallace Stevens, Walt Whitman, William Carlos Williams, and William Butler Yeats. My great guilty pleasure is that I’d rather reread than keep up with what’s new. You’ve been a vocal defender of “difficult” poetry. Why? I feel the same way as lovers of opera or rock music or hip-hop: If I’m having a good time, I don’t need to understand every word. If it sounds good, and has emotional conviction, I don’t worry about being able to write a term paper about it. Your writing is noted for its sense of humor. Who do you think of as great humor writers? Max Beerbohm. Mark Twain, of course — his dismantling of Fenimore Cooper, his description of inadvertently burning down the woods on one shore of Lake Tahoe, the dog with sores that jumps into the ammoniac Mono Lake and then runs off “with considerable interest.” In poetry, I like Louise Bogan, J.V. Cunningham, Robert Herrick, Ben Jonson, Frank O’Hara, Stevie Smith. Bishop does it in “House Guest” and “Manuelzinho’’ — I don’t know how, but she gets away with comic poems about servants. I’m not charmed by “light verse” — I have more of a taste for salt than sugar. If you had to spend a year locked up with the works of just five writers, who would you pick? I’m entirely old-school. Give me Homer, Horace, Shakespeare, and Anonymous, and you can choose whatever you want for fifth place. Got suggestions for future Bibliophiles? Find us on Facebook or follow us at GlobeBiblio on Twitter.